In high school, I was lucky enough to have one pretty amazing best friend. I don't even remember how Zac and I started talking but yet I can't remember a time when we weren't completely inseparable. When we were seniors and my husband (then boyfriend, of course) had already moved three hours away to college, Zac pretended my sobbing-at-my-desk tears weren't totally irrational and drove me three hours up after school just to tell my husband goodnight in person -- and then we hopped in the car and drove three hours straight back. Granted, this wasn't the exact story I told my parents (something about Zac and I going for pizza and then a movie or something) and it was probably the most trouble I've ever been in once they found out (because I left my e-mail up on my computer screen, if that tells you how totally not sneaky I am). Zac was actually always good at saving me when I did stupid things, which was scarily often. I think we both were somehow completely stunted by high school and so we always convinced one another that lunchtime was a perfectly great time to skip out and grab a coffee at Starbucks while talking about all of the wonderful things that could be accomplished if we weren't, you know, stuck in high school. At the time, our high school offered a special program for kids who were totally one-tracked about the direction their future was headed and actually showed potential about accomplishing these dreams. Instead of taking two classes we would never use, we got to focus on interning and basically working on our craft or career of choice so that after high school we would basically be there. I, of course, chose writing. I was going to write books, don't you know. Considering I stepped into senior year with one already under my belt, my teenage arrogance got the best of me. I had written an entire novel that year for my final presentation but it never went anywhere and instead I followed my boyfriend-now-husband three hours up to Orlando to just be in love. Zac, on the other hand, was going to be a firefighter. No, you don't get it: he was going to be a firefighter. There was something so totally passionate about his love and determination for becoming a firefighter that it was almost contagious. Where we once felt so stunted by high school and it's corresponding tedious projects, Zac was busy pouring his heart out into just being a firefighter. 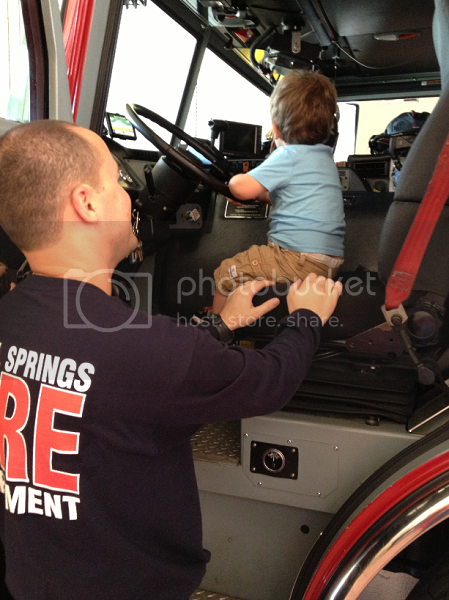 I'm hesitant to even say "becoming" a firefighter, because in his heart, he was already one. At the end of the year when Zac gave his presentation, it was as if magic had just happened in that classroom. There weren't many dry eyes and I recall one heck of a standing ovation, even from the firefighters who had come to watch and support him. I wrote a What Ethan Is Reading post recently that included a book that Ethan is, of course, most often reading: Curious George & The Firefighters. My husband and I like to jokingly ask Ethan what book he'd like to read next, knowing very well what the answer will be. 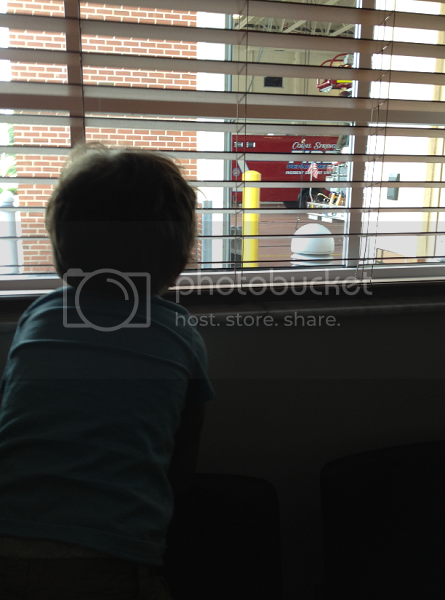 We suggest a wide variation of Curious George stores: the aquarium, the baseball game, making pancakes -- but it always comes down to Curious George & The Firefighters. It's basically a no-brainer. I'm not sure how Zac and I stopped talking as much as I'm not sure how we started. I had left South Florida for Orlando and desperately tried to find myself in a place that I didn't want to be, in a life that I both wanted and wanted to be different. Eventually those three hours from home grew longer and longer and somehow the time and distance got the best of us. And, you know, sometimes all it takes is one Curious George book about firefighters to waltz your best friend back into your life a zillion and forty years later. Or close to it. Because now instead of doing stupid things and skipping class, we're all married and responsible (and, you know, I'm a parent). A zillion and forty years it is. When we first arrived to the fire station, we met up with Zac and almost immediately the firefighters were sent on a call. 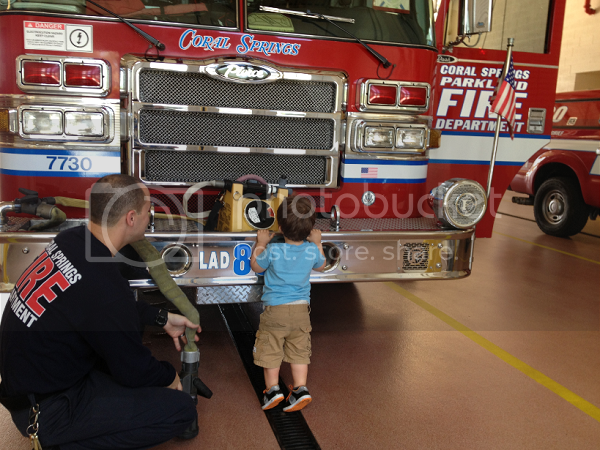 This was the first sign that Ethan was absolutely going to love his time at the fire station. 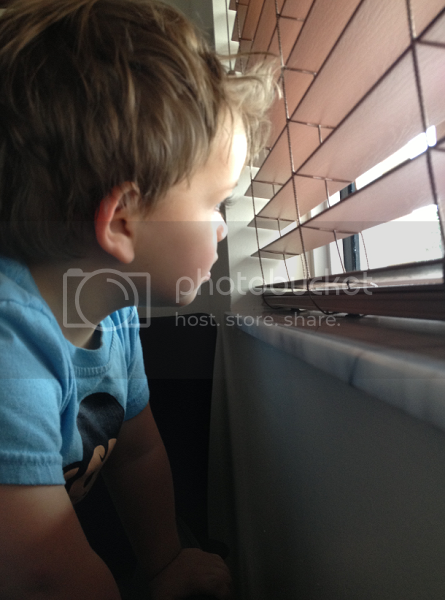 He was glued to the window watching the fire truck turn on it's lights and speed out of the garage. 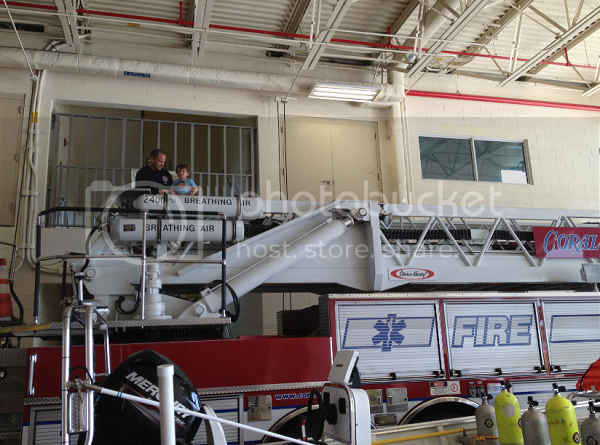 His favorite part was when he got to wear a firefighter helmet and ride a firetruck. 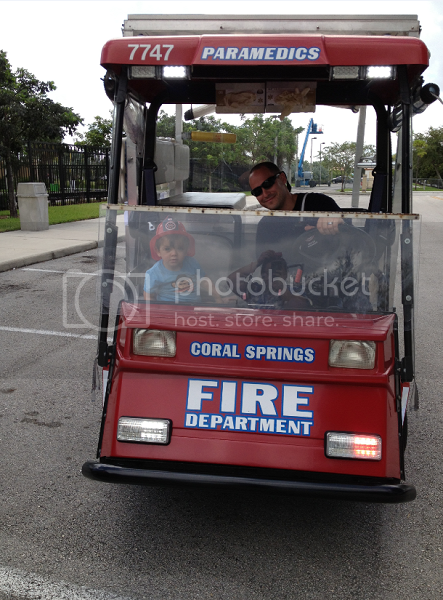 I mean, in actual life it was a golf cart, but it was red and had lights that flashed and it was a fire truck. 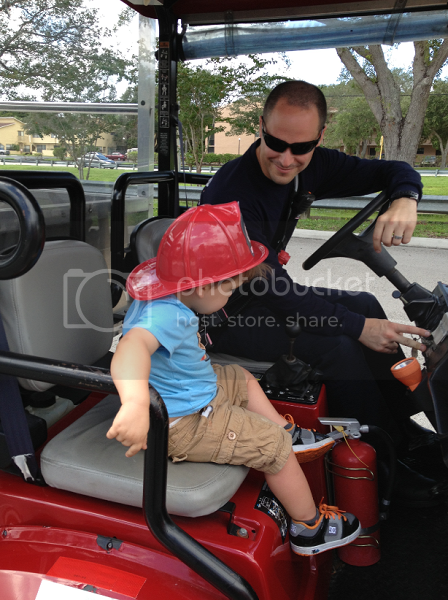 There will never be any way to top Ethan's happiness in that minute on the golf cart -- I mean, fire truck. 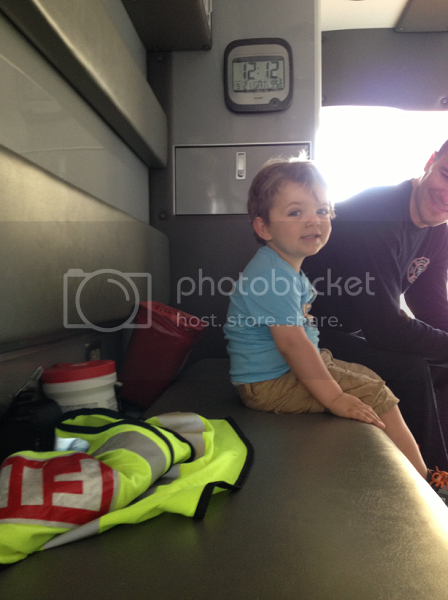 Kid was beyond elated -- and a real firefighter. I'm visiting from SSS Hop. This post is awesome. 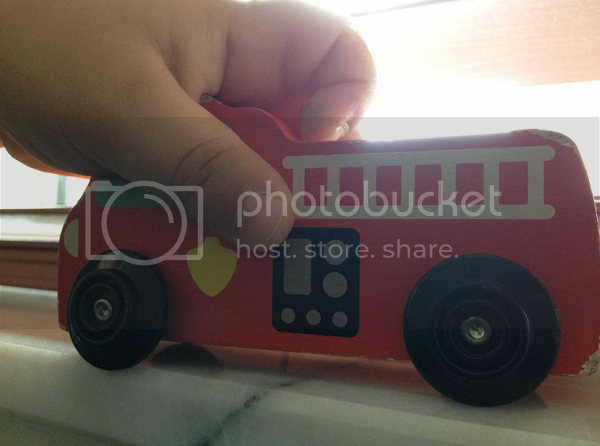 I love you photos. 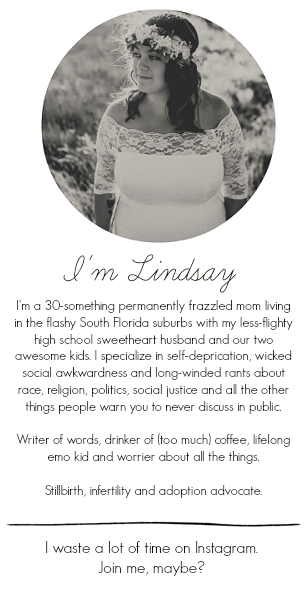 I'm a new GFC and Bloglovin follower. Hope you will visit me also.